The poster of this question is not alone. I know very little about the Twilight series other than they are very popular and have a following of foam-at-the-mouth rabid fans. So many of my book friends have read and reviewed them. Now the movie trailer is everywhere. I do feel a bit of pressure to read them. Not from anyone else, mind you, but from myself. What am I missing here? Anything? Maybe if I was younger I might be more susceptible to it. I remember reading Austen for the first time because there was the whole Austen craze in the 1990s when I was a young'un. Remember Gwyneth as Emma? That was a great example of peer pressure though. I fell in love with Austen. I have not read one single Harry Potter book. Not a one. Put down the torches please. Some how I've managed to not read the books that are almost as popular as the Bible. I'm just not that into teenaged wizards. I've seen the movies and I still don't feel compelled to read them. Maybe someday. And that's how I feel about the Twilight series. It's not really on my radar at the moment. Maybe someday. That's not to say I don't sometimes fall for it. Since blogging I've read Gaiman and Colleen Gleason entirely because of other bloggers who've read them. I'd never heard of either before. I'm not disappointed that I did either. I've had a good time reading their books. I also had no idea what a Poppet was before blogging either. Now I have two. I guess marketing is hit or miss with me. Maybe it's the huge hype that turns me off. If you ask me, you're not missing much. I read the books for work and think they are overrated and poorly written, and it really bothered me that Bella isn't a very strong female character. More details in the Book Review section of The Book Lady's Blog . I read one Harry Potter (the first) because of pressure, and I've regretted the waste of my time. I feel much the same way. I haven't touched a Harry Potter book, either, and in fact sometimes all the hype does turn me off. Sometimes it's fun to be in on the buzz, but it would have to be a book I am interested in anyway, not just because it is currently popular. At any rate, I'm not a peer pressure reader. I read what I think I'm going to like! Diddo on not having read Harry Potter or the Twilight series. I just have no interest whatsoever. I know they're popular and everyone loves them, but that's part of what turns me off. I'm stubborn like that. To piggy-back off of what rjsbooklady said, I've also heard that they're entertaining yet badly written. That's not much of a recommendation for a book I'm not really interested in in the first place. If I think I'll find a book interesting then I will read it perhaps despite the hype and take it for whatever it is. I find myself strangely tempted to read the first Twilight book,if only to see what the fuss is about, but I'll take my time with that one! As a slight aside - I had no idea what a poppet was until I started reading Neil Gaiman's blog but now I've got my eye out for a sculpture! You're not missing anything with Twilight - trust me. And hype turns me off too. I think that's why I have an aversion to Oprah's book club. The marketing, to me, can overkill a book. I like to watch what people are reading at my coffee shop and if more than one person is reading the same book, then it will be an exile off my list! Great answer :) I don't like hype at all but I don't let that decide my reading. Usually I check out the synopsis - if it interests me I read, if not I don't. Perhaps some time later I might become interested but mainly I read for my own pleasure, not because someone says I should. I started reading Harry Potter books after watching the movies; but as for Stephenie Meyer's books, that's a different story for me because I enjoyed the first book way before the hype. 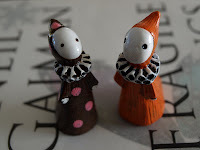 I didn't know about those adorable poppets too until some fellow bloggers mentioned about them. They're too cute to pass up IMO! Ha ha--I still don't really know what a poppet is. I know what a poppet is, just not WHAT a poppet is. They sure are cute, though. I've read a lot that I wouldn't have read if not for blogging. Some bandwagons I don't care to hop on, though (Twilight series!). I've started reading Twilight way before the hype and no, I'm not one of those foam-at-the-mouth rabid fans. I'm not too fond of Harry Potter although I started reading the series way before the movies come out. I stopped at Book 4 after more or less satisfying myself to see what that was all about. Not my cuppa tea but one never know, I might just continue reading if the mood hits me. I think it's the hype that puts me off. Nothing could live up to those expectation.